If there is one common element I've observed among very successful traders it's that they have superior personal networks. They cultivate sources of information; they take on role models; they hang out with people they admire. In all, they spend time with people who make them better. This can become our online strategy as well. We can become caught up in noise and bickering online--or we can surround ourselves with inspiration and information. But how do we know where the great sources of online information can be found? One simple but effective strategy is to find the people who post ideas online and do so with a passion. They post regularly, and they post over periods of years. They do so because the ideas speak to them. 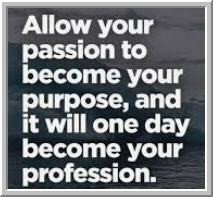 Their passion has become a purpose--and very often it anchors their profession. Once you find a few such sites, you can then see who those people link to and whose work *they* admire. The odds are good that purposeful, passionate people hang out with--and link to--others of their kind. Before you know it, you can develop a network simply by following the links of those who post with purpose. What an amazing resource hidden amidst the noise. Here is my recent article, highlighting four of my favorite purposeful online participants. Follow their links and you'll learn a great deal. And if you have your own favorite online participants, feel free to email me with their links and I can add those links to future posts. It's a great way to build each other's networks and support people doing great work. Why Do So Many People Pursue Trading?